KM's Hayloft Alfalfa Complete and Timothy Choice pellets are only available online. Oxbow's Cavy Performance (alfalfa-based pellets) and Cavy Cuisine (timothy-based pellets) are available online, at certain veterinary clinics, and in some pet supplies stores and feed stores. Helpful information from Oxbow Hay Company. Is your brand of pellets nutritious? Find out more in this thread. 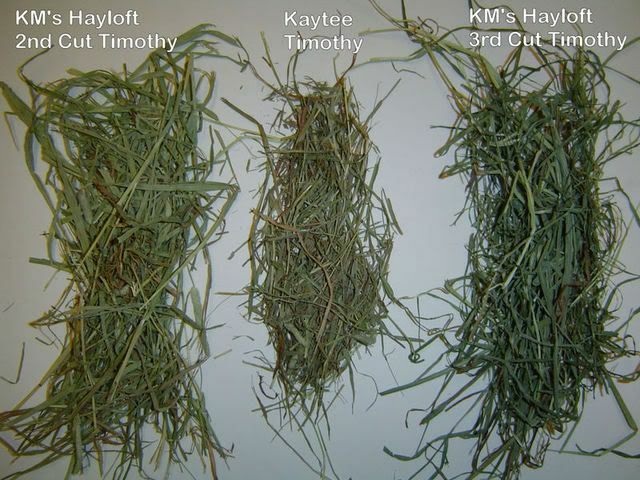 KM's Hayloft offers Bluegrass grass hay, timothy grass hay, and a mix of alfalfa and Bluegrass grass hay. Oxbow offers Western timothy grass hay, Orchard grass hay, alfalfa hay, and other speciality types of hay. Oxbow also offers hay cakes, which should not be considered as a substitute for grass hay. They are popular with some guinea pigs and may be fed in addition to grass hay. Remove the plastic immediately, and store your hay properly.